The same effect as taking a bathingball between your hands and bring it a meter or so under water when in a pool. When you release your grip on the ball, be sure to keep your face away...., because that ball will be a rocket. She does indeed appear very 'sturdy and strong' and she got a pleasant design, even though it is a bit bulky. Sometimes, it just works very well, I agree. I spotted this cruise ship heading throught the Miraflores Locks today. Some ships does indeed produce better speeds at forward trim, but it is quite unusual I think. The only other ship I can think of sailing better at forward trim, was the Leeward of Norwegian Cruise Line: she sailed best at 1.05 meter forward trim because the water slipped better away from the stern then (she had a very unusual design beneath the water line and aft trim created additional drag aft of the ship). 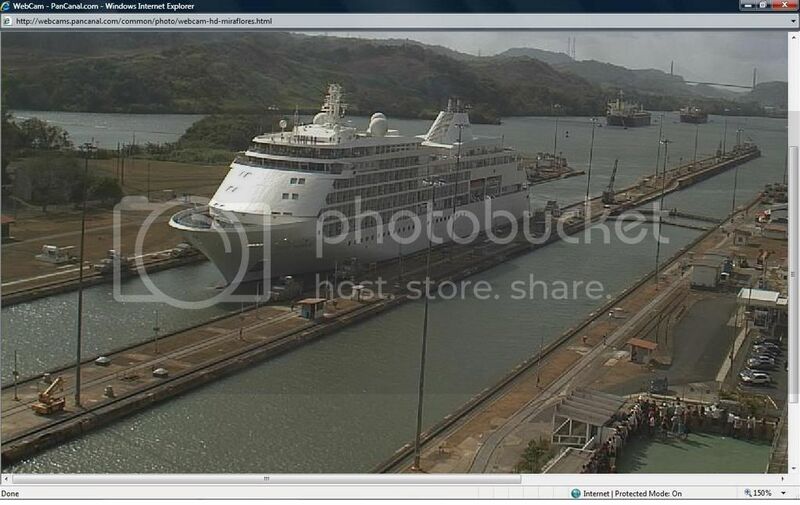 pilotdane: thanks for the Panama Canal capture of today: I think it looks like one of the Silver Seas - ships...: could it be the Silver Shadow maybe? could it be the Silver Shadow maybe? Last edited by Sterkoder; February 24th, 2009, 01:11. Bengt, it looks sooo COLD there today!! I'm watching the robins play out in the garden...I guess spring is here in Georgia--HOORAY! Both trawlers look a bit low in the bow but Harvest seems to be sitting very low in general. I am not used to seeing open ocean ships with such shallow freeboard. I imagine her main deck is under water often in heavy seas when she is fully loaded. Thank you for the video. I am glad I decided to NOT become a fisherman in the North Sea. On the positive side they do not have to wash down the decks. Mother nature seems to be doing a very thorough job. I am afraid I would not make a good captain on that boat. I would have the deck hatches welded shut. Oh...., could I ever experience rough seas!!! You can't get a low cost ride in heavy seas anymore, and even the katamaran between Kristiansund and Trondheim docks in the worst weather. (The boat can take it, but the company wants to spare the passengers for the ride). Fabulous update from the North! Thank you very much Asimut. And a picture from yesterday evening of "Olympic Prawn"
Asimut, such great photos from Tromsø recently! I was especially delighted with the photo of Olympic Prawn in your earlier posting. OK, I am about to say something really silly – or maybe not – is it just me that finds that name amusing? Anyway, nothing in the gorgeous smile of the day thread gets anywhere even close to the effect a ship called Olympic Prawn has on me! 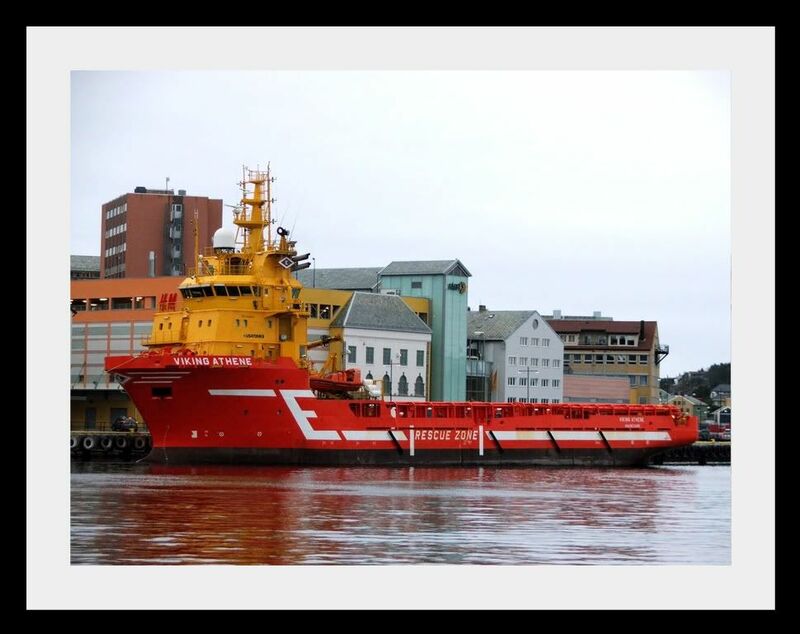 I was interested to read about their ship F/F Jan Mayen and the research activities of the University of Tromsø, as well as all their offshore and fishing activities. What a lot of exciting things this company is involved in.